In the summer of 2013 there was a two day concert on the beach in Hastings, organised as a fundraiser for the RNLI. 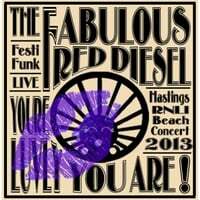 The Fabulous Red Diesel played on the Sunday afternoon and unbeknownst to the band the whole set was recorded. Whilst we've dropped the first song (we didn't want too many old tracks on here), what you have here is exactly as it was on the day, there's been no overdubs and no editing, just a snapshot of a moment in time which we are putting up here as a huge big thank you to all all fans.